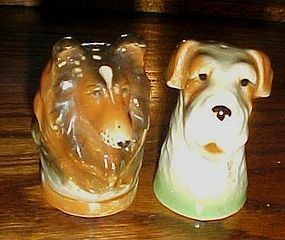 Wonderful old Japan marked dog salt and pepper shakers. Head busts of a collie and the other is a terrier or airdale. 3" tall Original old corks (one is inside the collie). Perfect condition. 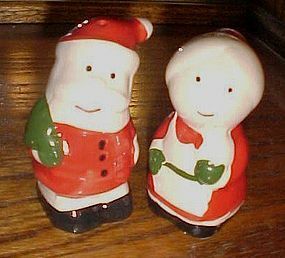 A wonderful addition for your vintage salt and pepper shakers. White spots are just glare. They are much nicer than photo shows. 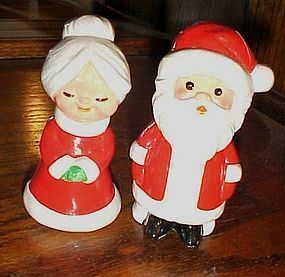 Atico Yuletide Traditions Christmas Ornaments Happy Holidays Salt and pepper Shakers 4" tall, 2-5/8" diameter, nice stoppers. Different ornament decoration on each side. Perfect condition. Nice for Christmas. B&D blue ribbon geese pattern with blue and white calico background. Measures 3 1/2" tall. Perfect condition with nice plastic stoppers. 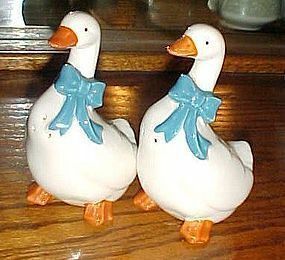 These vintage geese salt and pepper shakers are quite large in size. Each goose is about 5 3/4" tall. They come with their original plastic stoppers. It says B&D Japan on the bottom (in mold). They are made of ceramic and perfect. The paint on the ribbons are perfect too. These could go with the Aunt Rhody, Blue goose, or Ribbon Geese decorative kitchen lines. 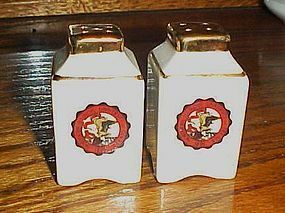 Great vintage porcelain salt and pepper shakers with the Northern Illinois University at Delkab 1895 logo with real gold trim. Measures 2 3/4" tall, with logo and trim bright and nice. Original rubber stoppers intact, but I would change them if I was going to use them. 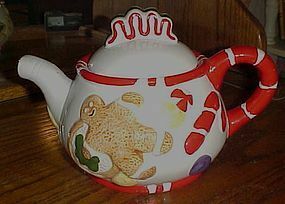 Adorable ceramic teapot decorated with 3-d gingerbread cookies and assorted candies. Festive peppermint candy handle and base. 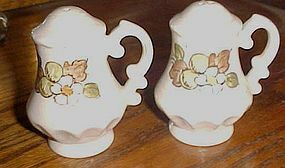 Nice large size, measuring 6 1/2" tall and 10" from spout to handle. Would be great for hot cocoa. Perfect condition with no chips or cracks. safety notch on lid. 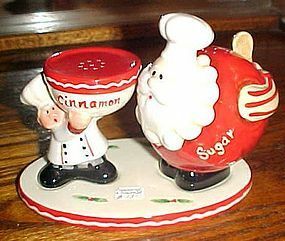 Holiday Cinnamon and Sugar shakers on a platter. Sugar being Santa measures 4 1/2" tall and the Baker that is Cinnamon measures 3 1/4" tall. The platter is oval and measures 6 1/2" long by 3 3/4" wide. Made by Home Interiors. Very cute set perfect condition. No Box. 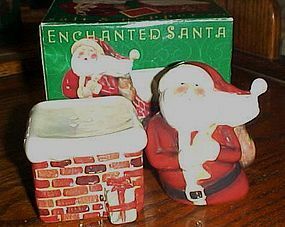 ENCHANTED ceramic SANTA SALT & PEPPER SHAKERS from Certified International Corp. Designed by Susan Winget. New in box. Santa & chimney. Santa sits on the chimney. Brand new in the box. Nice large size. 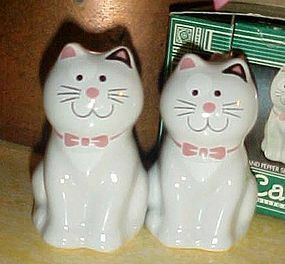 Adorable kitty shakers are made of ceramic and are in the original box. Measures 3 1/2" tall and have never been used. 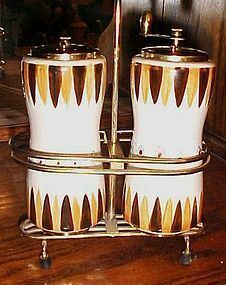 Wonderful large ceramic salt and pepper mills in a brass colored stand that matches the hardware on the mills. Mills are made of ceramic and are 6" tall (Plus the metal parts and stand) Decorated with a cool mid-century pattern of orange and brown. Great vintage condition. No chips, or cracks on the ceramic and no pits or discoloring on the metal. The 4 little rubber feet on the caddy are still in great condition too. Metlox Potteries, Fruit Basket pattern Vernonware V980 made in California, USA Vernonware Division. Description: San Fernando; Brown basket with fruit, white flowers. Now Discontinued: 1961- 1986. Perfect condition but stoppers are missing. 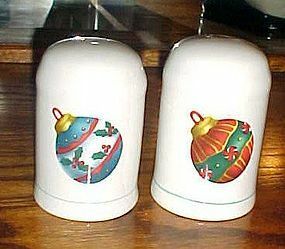 Nice pair of vintage salt and pepper shakers. 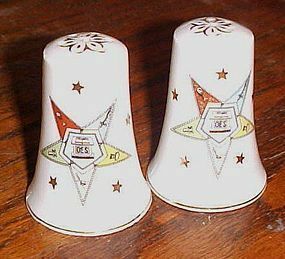 These are ORDER OF THE EASTERN STAR ( OES) shakers. Hand painted; made by Lefton China. Accented with gold. Each shaker measures 2 3/4" in height x 2" at the base. Stoppers are needed. Both are in very nice vintage condition with no damages or repairs. 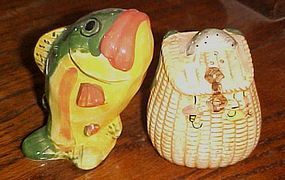 What a cute set of salt and pepper shakers for your fishing cabin. Large mouth bass and a fishing creel. Fish is almost 4" tall. Made of hand painted ceramic. Great condition with no damages and has original stoppers. 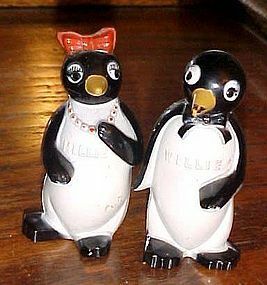 Willie & Millie Penguin 1930's Salt & Pepper Set FF Mold & Dye Works Dayton OH. Used, good condition, some wear from age (see picture). These are plastic salt and pepper shakers, measure approximately 3-1/2" high, are really cute and well cared for, with good colors. Millie has a red bow in her hair and is wearing a red necklace, and Willie has a black bow tie. A great addition to any salt and pepper collection. If you are a Cardinal baseball fan you will love these whimsical salt and pepper shakers. 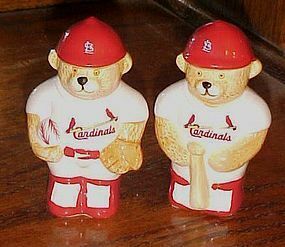 Adorable bears dressed in Cardinal;s baseball uniforms, One is a pitcher ad the other is the batter. made of hand painted glazed ceramic. Measures 4 1/2" tall. Pefect condition with original stoppers. Cute gift for a Cardinal's fan.